Microsoft has made no secret of its grand plans for chat bots, and this week it rolled out five new ones for Skype. Surely the most fun is "Spock," a bot that promises to help you "learn the ways of Vulcan logic." Back in April, Microsoft debuted a preview of Skype bots, the artificial intelligence-based helpers it hopes will make it easier for users to get things done. Today, more than 30,000 developers are building bots for Skype, it says. The five new ones introduced this week were all inspired by partners and developers, and they're all now part of the Skype Bot directory in the service's Android, Windows, iOS, Mac, and web apps. The Skyscanner Bot, for instance, focuses on trip planning and allows users to search for flights either individually or as part of a group. Based on location suggestions like “Paris in July” or “Spain,” it returns live prices and route options. Also targeting travel planning is the Hipmunk Bot, which provides flight, hotel and general travel advice based on the user's preferences, which can emphasize price, vacation theme, or even minimizing travel agony. The StubHub Bot can help find tickets to artistic and athletic events, while the IFTTT Bot delivers automated messages from apps, devices, and websites based on triggers set by the user, including breaking news, weather, social media notifications, or someone at the door. 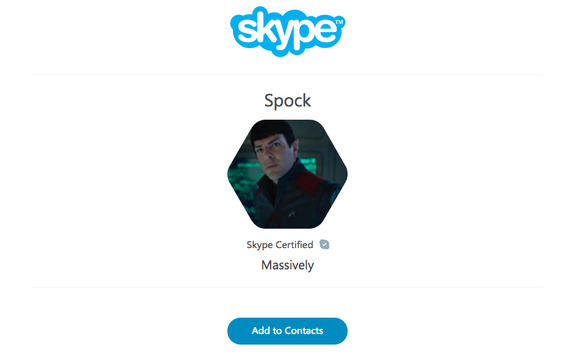 As for the Spock Bot, it lets users chat with the second in command of Star Trek's USS Enterprise, including exchanging instant messages and photos. "The more you use bots, the better they get at anticipating your needs," Microsoft said. "We want bots to become the quickest way to handle simple tasks, like shopping or managing your calendar, and the most effortless way to complete complex tasks, like planning a vacation from scratch." In June, Microsoft acquired Wand Labs to accelerate its efforts in what it calls "conversational intelligence."